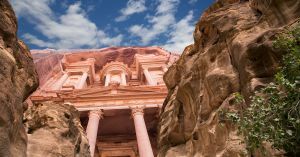 Petra, what today is one of the Seven Wonders of the World, was the capital of the ancient Nabatean Kingdom. This long lost city, carved entirely into rose-red sandstone rocks, is a mystic and magical place, an eternal tribute to a lost civilization. 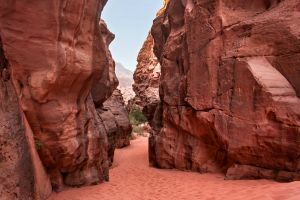 The ancient city is entered through the Siq, a deep and narrow gorge, lined with rocks of fantastical shapes and colors. 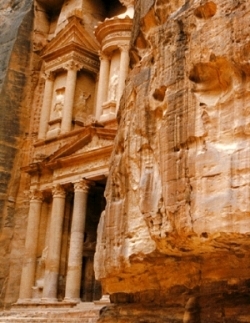 In the end the Siq reveals the drama of Petra's most recognizable monument, the glorious Treasury building. Inhabited since prehistoric times, the Nabataean caravan city of Petra, situated between the Red Sea and the Dead Sea, was an important crossroads between Arabia, Egypt and Syria-Phoenicia and bears a unique testimony of a disappeared civilization in which ancient Eastern traditions blended with Hellenistic architecture. 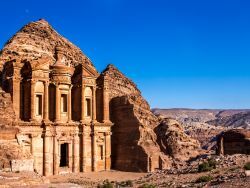 Petra lies south of modern Amman on the edge of the mountainous desert of Wadi Araba, surrounded by towering hills of sandstone which gave the city some natural protection against invaders. It was for centuries the meeting point of the main routes used by camel caravans transporting spices between the Mediterranean and the Near East, Africa and India. 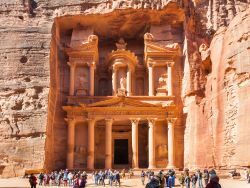 Petra was first established around the 6th century BC by the Nabataean Arabs, a Semitic people who laid the foundations of a commercial empire that extended into Syria. In AD 106 Trajan annexed the Nabataean Kingdom as part of the province of Arabia. 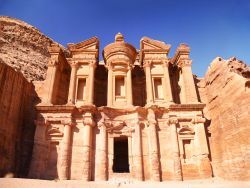 The many earthquakes that hit Petra triggered a slow decline for the city, which was not halted by its designation as an Archiepiscopal See. The Arabs conquered the city in 636 but it remained distant from the pilgrim road to Mecca. 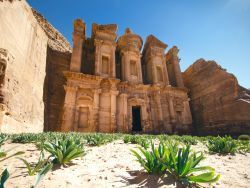 The Crusaders constructed a fort there in the 12th century and Petra returned to its ancient splendour, but soon they withdrew, leaving Petra to the local people until the early 19th century, when it was visited by the Swiss explorer Burckhardt. North from the Khazneh lies the massif of Jebel Khubtha. Three large structures (Royal Tombs) are carved into the rock face, which is known as the King's Wall. First is the Urn Tomb, a well-preserved monument that faces on to an open terrace fronted by a double row of vaults. A colonnaded cloister runs along the northern side of the terrace. The elaborate facade fronts a single, unadorned room. The walls are smooth, the interior corners exact. The only decoration to be seen at present comes from the beautiful whorls of different-coloured sandstone in the walls, ceiling and floor of the chamber. 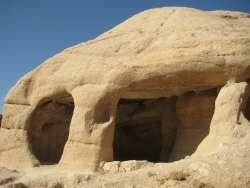 The Corinthian Tomb, a smaller version of the Khazneh, is followed by the Palace Tomb (Silk Tomb), named from the extraordinary chromatic effect of the rock. Some distance away from the Royal Tombs, to the north, there is a tomb built in 130 for the Roman governor of the city under Hadrian, Sextius Florentinus. The Khazneh el Faroun, or the Treasury of the Pharaoh, is an imposing facade standing some 40 m tall, cut directly from the rock of the mountainside. On the lower floor is a portico with six columns, crowned by floral capitals and surmounted by a fronton; the third floor is divided into three parts at the centre is a tholos with a conical roof, surmounted by a urn, and on either side two half-frontons, supported by columns. An architectural and sculptural decoration of the highest quality adorns the architecture elements and the front of the building. The Khazneh is the only rock-cut building in Petra that presents absolutely no Nabataean element and attests to link exclusively with the Alexandrian world and Hellenistic artistic traditions. Behind the impressive facade, a large square room has been carved out of the rock of the cliff. This is typical of the tombs in Petra; the interiors are as plain as the exteriors are intricate. The Siq is the gorge formed by the torrent, the Musa, which the Nabataeans blocked with a dam and channelled to carry drinking water to the city; along the rock walls of the Siq there is a succession of inscriptions, niches and small votive altars, but also reliefs and sculptures that depict a caravan of men and camels. Once inside, the Siq narrows to little more than 5 m in width, whereas the walls tower up hundreds of metres on either side. The floor, originally paved, is now largely covered with soft sand, although evidence of Nabataean construction can still be seen in some places. 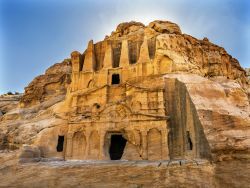 There are also noteworthy relics from Roman times: at the southern edge of the valley stands the 1st century AD theatre, carved almost entirely in the rock, which could hold more than 8,000 spectators, while at the end of the Siq the ruins open out of the colonnaded way. Set on a promontory that overlooks the valley of Petra to the west, accessible via a type of sacred stepped way cut into the rock, is another building with an imposing facade carved out of the rock: this is al-Dayr, the austerity and the simplicity of which join to demonstrate the original local version of elements of the Hellenistic tradition. The structure of the interior is devoid of any funeral installation.